Preimplantation Genetic Diagnosis is a sophisticated scientific technique which can be used to test embryos for either a specific known genetic condition or chromosome abnormality. It refers specifically to when one or both genetic parents has a known genetic abnormality and testing is performed on an embryo to determine if it also carries a genetic abnormality. 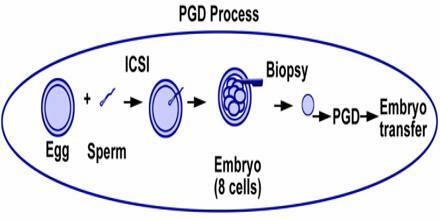 Preimplantation Genetic Diagnosis is used to denote procedures that do not look for a specific disease but use this techniques to identify embryos at risk. As with all medical interventions associated with human reproduction, “Preimplantation Genetic Diagnosis” raises strong, often conflicting opinions of social acceptability, particularly due to its eugenic implications.